Traffic School Q&As: When a police officer suspects a driver under 21 of taking drugs or alcohol, that youth must submit to a ___________ test. Find traffic school, defensive driving course & video review. Final Exam questions & answers. Is it illegal to drive with headphones? When a police officer suspects a driver under 21 of taking drugs or alcohol, that youth must submit to a ___________ test. Question: When a police officer suspects a driver under 21 of taking drugs or alcohol, that youth must submit to a ___________ test. B.) First Drug offense test. BEFORE BUYING A CERTIFIED PRE OWNED WARRANTY USED CAR: Use car budget calculator - you can afford on used car • Choose appropriate car model • Check pre-owned car costs, fuel economy and other standard features • Purchase certified pre-owned car for manufacturer & additional extended warranty • Verify used cars documents - bill of sale, title transfers, duplicate title, license plate & registration • Get Best & cheap car insurance on used cars • Know service & vehicle history reports • Get used cars for sale nearby • Have pre purchase inspection - car exterior, interior, tyres & engine • Do test drive the car on different road conditions. The purpose of driving safety program is to increase road safety awareness by reducing traffic violations and to keep your auto insurance premiums low. Handle Speeding ticket, stop sign citation, lawyer for fighting traffic tickets & other violations. Q - Child restraint anchorage systems should have __________ lower anchorages. Q - There have been improvements to ABS including __________. There have been improvements to ABS including __________. Q - Before you have work done on your vehicle, ______________. Q - Do not try to drive more than __________ hours in any one day. To lower the risk of a collision, you should keep at least __________ of space to one side of your vehicle at all times. Q - The Federal Motor Vehicle Safety Standards are written in terms of __________ safety performance requirements for motor vehicles. The Federal Motor Vehicle Safety Standards are written in terms of __________ safety performance requirements for motor vehicles. Q - Most drivers make __________ driving errors for every 20 decisions they make while driving. Q - Several factors can cause tire failure including under inflation, hard braking, and __________. When two cars arrive at an intersection at the same time, which one has the right-of-way? • Donate your Old Car for Tax Credit. • Car Donation - Get Full Tax Deduction. • Fast Pickup within 48 Hours. • No DMV Hassles. Donate Now! • No Paperwork for you. Free Towing! • Fast & Easy Way to get rid of your used Car. • The Easy Way to do Kindness with your old Car. • In the event of a vehicle accident, drivers are legally obliged to stop if their vehicles has caused injury or damage. • You must ensure the scene is safe; switch off all engines, turn on hazard warning lights and alert oncoming traffic about the accident. • Call the emergency services (911) if anyone is injured, the accident has cause a hazardous situation or anyone involved in the accident has left the scene without leaving their details. • Exchange your name, phone number and insurance company details/information with the other driver and make a note of their car number. • Get the details of any witnesses to the accident. • It may also be useful to take pictures of the scene. • Regardless of fault or if you're planning to make a damage claim you should inform your insurance company of any accident you are involved in. 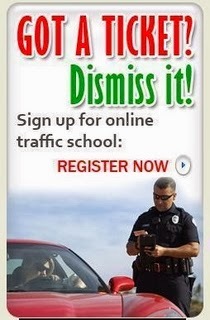 Got a traffic ticket and ordered/referred by Court to do a traffic school or defensive driving online course? Looking for an affordable, quick and easy driving safety class? Enroll Now ►for Ticket Dismissal, Point Removal and to avoid Car Insurance Premium hikes. Getting pulled over and being issued a traffic ticket is really a good way to ruin your day. Taking a traffic school /defensive driving online course is the best way, you can do it all from the comfort of your own home, to get rid of an unwanted traffic ticket, dismiss your ticket from your driving record. Vehicles must stop when the bus displays flashing red warning lights and extends the stop signal arm. Vehicles may not pass until the flashing red lights and signals are turned off. • Littering. • No seatbelt. • Illegal U-turns. • Failure to stop. • Failure to yield. • Reckless driving. • Unrestrained kids. • Unrestrained pets. • Illegal right turns. • Following too closely. • Texting while driving. • Violating railroad rules. • Open container violations. • Failure to use a turn signal. • Passing in a no passing zone. • Faulty/inoperative brake lights. • Running a stop sign or red light. • Driving at night without headlights. • Noise violations, from loud stereos. • Failure to maintain directional signals. • Excessive display of acceleration, (burnouts.) • Not stopping for pedestrians or for a school bus. • Turn from an unapproved lane/Unsafe lane changes. all vehicles carrying passengers for hire, all buses carrying passengers and all vehicles carrying explosives or flammable liquids must always stop no closer than __________ and no farther than __________ from railroad tracks. child restraint anchorage systems should have __________ lower anchorages. do not try to drive more than__________hours in any one day. do not use your horn directly behind a __________ or a horse rider on the side of the roadway. during each mile you drive, up to__________events you need to interpret can occur. if parts are replaced when you have work done on your vehicle, __________. if you do not have __________, always drive with your low-beam headlights on. if you drive through water, your brakes may become slippery and ineffective. to dry the brakes off, __________. intoxication manslaughter is a felony of the second degree, and it is punishable by a fine up to __________, imprisonment up to 10 years, and license suspension up to two years. many collisions become more serious when drivers __________. most drivers make__________driving errors for every 20 decisions they make while driving. new pedestrian and school zone signs exist on the roadway to warn drivers of an approaching crosswalk. they are_______. on an annual basis, animal-vehicle collisions cause about __________ worth of damage. on average in the u.s., one friend, parent or family member dies every__________minutes in alcohol related crashes. place or secure large items and loose objects in the __________ for safety and to deter theft. select a travel lane with the least amount of congestion and stay in the lane you have chosen until you need to turn, __________, or avoid a hazard. the use of turn signals and your __________ are the methods of communicating to other road users that are used most often. when driving at night and you encounter curves, what do you have to remember? while driving in the city, the busy urban environment can induce ___________. you may not operate a vehicle unless all child passengers __________ are securely fastened into an approved child restraint device.